Abrade smooth surfaces and remove all loose rust and flaking paint with a wire brush. Remove dirt, dust and grease with diluted detergent. Rinse with clean water and allow time to dry. Paint a test patch of Hammerite Direct to Rust Metal Paint Smooth onto painted surfaces and leave for 1 hour. If there is no reaction apply Hammerite Direct to Rust Metal Paint Smooth directly to surface. 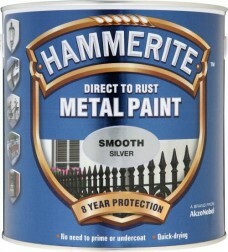 If there is a reaction, remove all paint before applying Hammerite Direct to Rust Metal Paint Smooth. 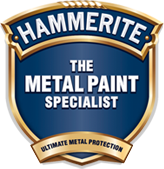 On bare zinc, aluminium and galvanised surfaces apply Hammerite Special Metals Primer before applying Hammerite Direct to Rust Metal Paint Smooth. Lightly stir before use. Do not mix vigorously. Do not mix paint from 2 tins or mix colours. Brush application: Do not thin. On previously painted metal in sound condition, 1 coat should be sufficient. On bare/rusty metal 2 coats are required. Ensure that all edges and corners are adequately covered. Do not over-apply as sagging will occur. Coventional spray application: Thin with Hammerite Brush Cleaner & Thinners at a ratio of 15% Thinners to Paint. Set spray gun at 25/35psi and use full fan spray at maximum volume. Apply 4 thin coats. Allow 1 hour between coats. Refer to spray equipment manufacturer’s guidelines for the correct and safe use of sprayers.